In the four decades that Neudorfer has been in business, we’ve continued to improve our products and processes. Although we’ve evolved over time, one thing has remained constant: our focus on the individual needs of our clients. That’s why we’re also a strategic resource. Our insightful and knowledgeable furniture team can help you choose the specifications necessary to create a high-quality working environment. Even after the final installation is complete, we’re available for further help. 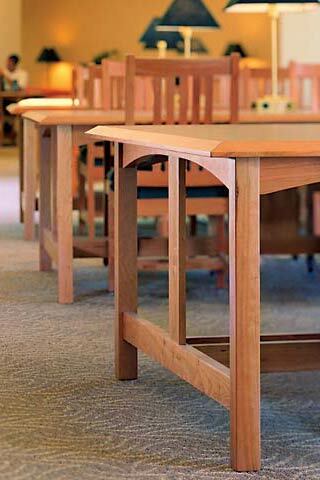 As for our tables, they’re unexcelled for classic design, careful execution, and durability. They’re also adaptable, as we can customize the size and shape with diverse surface materials, technology integration, and other special features. Whatever the setting—campus centers, libraries, seminar and conference rooms, dining rooms, courtrooms, lobbies, or laboratories—our furniture is perfect for areas where refined aesthetics are appreciated and quality is required. We’ve always taken our commitment to the environment seriously. In fact, we’ve been doing things for years that have only recently become fashionable. With our company located in the heart of Vermont’s Green Mountains, it’s only natural that we look for ways to reduce our environmental impact. That’s why we avoid needless waste and make furniture to last. Here are just a few of the responsible practices that help keep us green. Reducing V.O.C. emissions with formaldehyde-free catalyzed polyurethane finishes and highly efficient finishing equipment. Recycling heated discharge air from our dust collection system. Using an in-house computerized power supply system to lower electrical demand. Obtaining electricity from an electrical cooperative whose power is from 100% renewable sources. Conducting most of our business within a few hundred miles shortens shipping distances, lowers fuel costs, provides quicker service, and lessens shipping damage. Designing tables made to last (many with replaceable parts), which provides economic and environmental advantages over “throw-away” furniture of lesser quality. Using local hardwoods and offering sustainably harvested lumber and other renewable materials.